Here is the fourth of my top 10 Thailand golf courses. 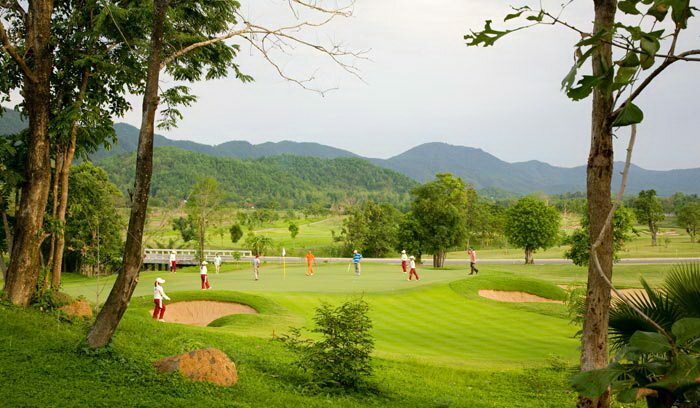 Chiang Mai Highlands Golf & Spa Resort is one of Thailand’s golfing gems. Built on a “power spot”, the hermitage of the revered Kuba Sivicha monk who founded the famous temple on Doi Suthep, the site is breathtaking in every direction and literally tingles with an energetic aliveness. Few courses anywhere in Asia have the scenic beauty, combined with challenging golf as this layout. Magnificent sweeping downhill holes to lakeside greens, valleys and hillsides provide a unique experience. Opened in 2005 Chiang Mai Highlands was immediately awarded one of the 3 best new courses in Asia Pacific. The course was designed by Schmidt-Curley, the same team responsible for Mission Hills China and Thailand’s Amata Spring and Siam Country Club. Playing 7062 yards from the black tees and 6621 yards from the blues, it is immensely playable and enjoyable for all levels of golfers. The 18th hole, a 558-yard par-5 (531 yards from the blues), is one of the great closing holes in Thailand. Sweeping along the edge of the course, it plunges to a fast flowing stream, with a bird’s-nest green perched high above. Locals as well as Chiang Mai golf visitors can relax at the on-site resort and top notch spa after their rounds at Chiang Mai Highlands, making a great golfing day even better. Chiang Mai Highlands Golf & Spa Resort is a member of Golf In A Kingdom, the collection of Thailand’s best golf courses and resorts.